Bryant Park fans know that one of the park's signatures is our 4,000 pieces of movable furniture. Our bistro chairs also bear their own interesting personal histories, and are the perfect perch from which to observe others' personal histories unfolding. Simply put, Bryant Park is one of the premiere people-watching spots in the city. We're not the only ones who think so, either! 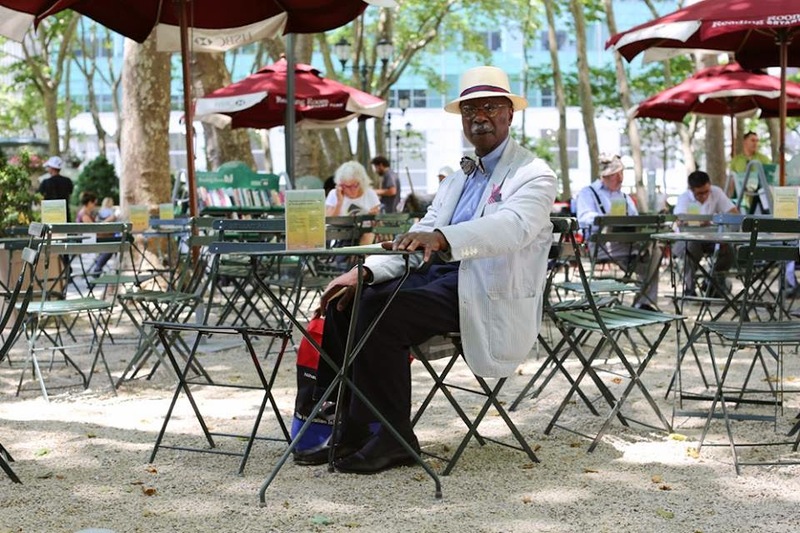 Bill Cunningham, photographer of street style for the New York Times, has been photographing the fashions and people in Bryant Park for years. Though he typically photographs people, one of his favorite Bryant Park characters is our magnificent Josephine Shaw Lowell Fountain, which has already appeared in two of his photo essays in 2015 alone. Bill Cunningham enjoys a spring lunchtime stroll in 2003. Next time you're in the park, look out for his signature blue jacket. Over the summer, Humans of New York also stopped by the park. True to the blog's format, the photos of New Yorkers are accompanied by poignant snippets of their conversation with the photographer. The subjects' fascinating and wildly different personal histories, ranging from a thoughtful doctor, to a loving mother, to an aspiring track star, show that Bryant Park is a true melting pot. The following interview, taken from Humans of New York, took place at the Reading Room. "Well, I’m a Christian, so I’d say love one another." Bryant Park has many French influences, from our manicured lawn, to Le Carrousel, to the bistro chairs throughout the park. And now we can add one more French idea to the list, one that is constantly in the park, though invisible to the naked eye: the concept of being a flâneur, or "a man of leisure, an idler, an urban explorer." In other words, a people watcher!